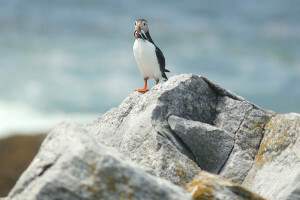 A puffin holds white hake in its beak after landing on Eastern Egg Rock in Muscongus Bay. During the "ocean heat wave" of 2012, small fish like the white hake and herring the puffins catch to feed to their chicks fled for deeper and cooler water. The puffins caught butterfish but their chicks couldn't fit the larger fish down their throats and many chicks ended up starving.